NintenGen: Nintendo Switch - Seasons of Heaven Exclusive New Info & New Preview! After a little over a year we are finally getting an update for the Nintendo Switch announced exclusive game: Seasons of Heaven. To get started with this preview it would be wise to get some background and history on the game and how it all started. Any Arts Production along with Creative Director, Nico Augusto started the Seasons of Heaven concept in 2013 and they have been in talks with Nintendo for quite a few years, and reportedly, Nintendo has been very supportive of the company throughout this time. 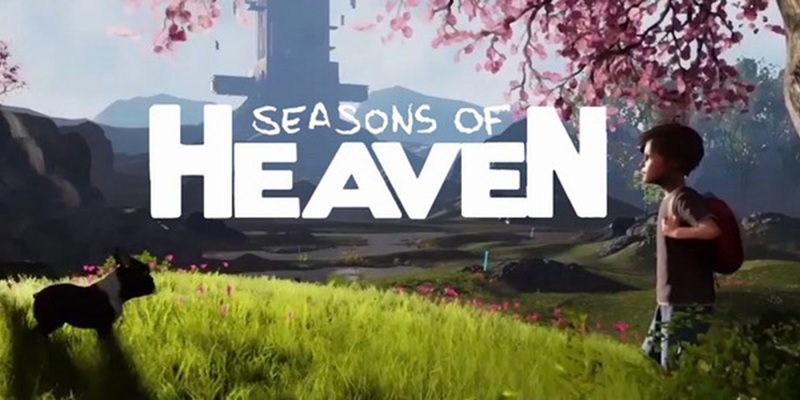 The Studio ended up making a decision about what to do with the Seasons of Heaven concept in the latter half of 2016 from a suggestion by one of their investors who asked them to make the game public in order to gauge fan interest after the Switch was announced. Any Arts Production was overwhelmed by the great response the game received so quickly and naturally began to feel some pressure that goes along with the high fan expectations, but none of this has stopped them from continuing with the project. Seasons of Heaven is an Adventure game for the Nintendo Switch that is based on a trilogy of novels. These books will be releasing over the next couple years and are connected in a unique way to the game. How Heaven Works: Yann (a young boy protagonist with Asperger syndrome) and Ani (Yann's pet dog and best friend) wake up on an island completely alone where a Ghost tells them that if they want to find their parents, they have to find their way off the island first while looking for any secrets along their way. During their journey they discover that many people lived on the island from a long time ago, far in the past, an uncertain past they will be trying to uncover the secrets to as the duo progress through the story and quests. When you play as Yann, since he has Asperger syndrome, he has different aspects of the world that he can sense which creates different gameplay experiences vs Ani, the dog, who can sense the world in a completely different way than Yann, creating another separate gameplay experience. Players can switch between the two characters at any moment during gameplay to solve the various puzzles or landscape challenges that can be reached or met with greater efficiency by choosing one or the other protagonist. When playing the game, understanding and learning the environment through this gameplay mechanic of using both characters is a key aspect to it. There is one very specific, menacing enemy in the game, a Polymorphic Creature that is constantly coming after Yann and Ani during their adventure trying to kill them at all costs which also adds to the gameplay challenge and variety since the pair must continually run away from or avoid this mysterious monster that is striving to do away with them so desperately. Seasons of Heaven is what Nico describes and an “open adventure game” with objectives that can be completed in any order the player wants, allowing as much freedom as possible. The connection of family and friendship along with history of past and future events play a key role in how the atmosphere in Seasons of Heaven conveys the special relationship between Yann and Ani. A Real World Connection: In the soon to be released novel trilogy of “Seasons of Heaven” the books will have pages that are intentionally missing from them. These missing pages from the novels will in-turn be in the video game itself to connect the story together through both book and game. Nico describes that he and the team wanted to find a way to “transmedium” the book into the game and the game into the book, making both aspects better when used together. In terms of locations, the game has forests, mountain landscapes, old city locales, ancient civilizations and some Mayan Egyptian designed areas. Seasons of Heaven will also have some similarities to the designs from the Shrines of the Legend of Zelda: Breath of the Wild which were derived from old Japanese civilizations and mythology. Seasons of Unreal Engine 4: Seasons of Heaven was also the first Nintendo Switch game to be confirmed to be using Unreal Engine 4 when it was originally announced a little over a year ago. This has now been re-confirmed that the game is still using the engine to great effect in its current state of development. Unreal Engine 4 has been met with great praise by the team so far, as much as allowing them to create big advancements in the tools needed for the Switch to use with creating the game world. At the start of development, “Seasons” was being created on the Unity Engine. The team admits that while Unity was fast and it allowed them to build many things in the game world quickly, Unreal Engine 4 allowed them to create levels much faster and with more detail. In regards to the character animations, the studio is currently working on them by hand, however they did hear some of the criticism that the animation shown from the original reveal was not up to par to current standards. With this in mind, the studio plans that the final game will have full motion capture implemented in the animation routines. The big complement most fans had for Seasons of Heaven since it’s reveal has been the art direction and how vibrant and detailed the look of the environments appeared. Currently, while the look of the game and art direction will remain very similar to what was originally shown in the gameplay trailer, there will be some changes along the way in development due to the team getting some new art designers who joined production in the last year. Graphically speaking, depending on what Nintendo does with the Switch hardware going forward, namely if there is an updated version or revision, the team believes they may be able to exceed their goals in the graphical quality of the game in the final release since the game still has some time to go in development. In terms of controls, the team at Any Arts Production have some very clear ideas and plans on how to use the Nintendo Switch Joycon controllers for Seasons of Heaven, however currently due to some plans on controller implementation not yet being finalized, they will wait and provide details on this aspect in the future. To go along with the promising graphical presentation in Seasons of Heaven, the music direction is also showing signs of promise with the team able to secure the talented Oscar Araujo (Lead Composer for Castlevania Lords of Shadow 1 and 2) as lead musical composer for the game. Seasons of Nintendo Fans and No Microtransactions: Nico Augusto and Any Arts Production believe strongly in the core aspect of Seasons of Heaven being more attractive to Nintendo fans who enjoy these types of 3D adventure and exploration games. The company is also extremely focused on making sure that Seasons of Heaven is a deep and enriching single player experience with no outside influence of the big “AAA” publisher mindset who may try to encourage additional ways to make money from the game with microtransactions. In fact, when Any Arts Production was presenting Seasons of Heaven to some publishers to see if they would be interested to publish the game, one of the companies (who was not named) asked if they could add multiplayer and microtransactions to their project to give the publisher a chance to make further revenue on the game. For this reason, the team has had to actually decline working with some of these bigger publishers in order to keep the creative design of the game and not sacrifice their vision just out of greed for extra money later. Currently, Any Arts Production is funding Seasons of Heaven with their own money out of pocket with no outside support from any publisher and no Kickstarter is planned. The game is said to be a very personal life project for Creative Director Nico Augusto who is strongly determined and wants nothing more than to see the creative dream of his and the team come to life as something of an interactive novel to video game experience for each player. Heaven is a Journey: The most unique aspect of Seasons of Heaven, as we discussed earlier, is how the story is being told through books and in conjunction electronically through a video game in order to fill in any plot holes. This is one reason why the Novel trilogy will be released back to back each year starting in 2018, with the third Novel releasing two years from now along with the planned release of Seasons of Heaven for the Nintendo Switch in 2020. For now, we want to wish them the best in terms of the continued production and progress of game. Stay tuned for more updates later in 2018 regarding Seasons of Heaven for the Nintendo Switch from developer Any Arts Production. I would like to thank Nico Augusto and Any Arts Production for making themselves available to share this information on their project and for the video interview. Very very interesting. I can't wait for more updates. The premises of the game sounds very unique. Great to have some news, but arggg that's not the news I totaly wanted. I was thinking they had the money to continue the game but it seems that's not the case... hummmmffff Bonne route Nico !